MLS side Columbus Crew are one step closer to remaining in Ohio thanks to some help from NFL franchise the Cleveland Browns. 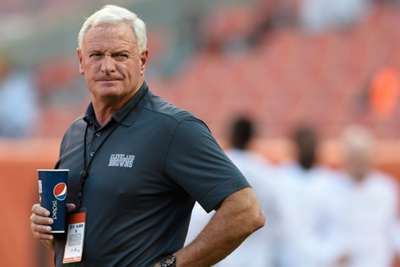 Browns owner Jimmy Haslam is part of an investment group that is trying to keep the Crew in Columbus. Crew's current owner Anthony Precourt has made it clear in recent months he would like to relocate the team to Austin, Texas. He reportedly wanted to put the team in either Columbus or Austin, whichever one would build him a stadium. MLS, though, is still planning to introduce an Austin team, saying "there is a clear path forward" to operate a franchise in the area. Haslam and the Columbus Partnership released a statement along with the MLS announcing their intentions on Friday. "Major League Soccer and the Columbus Partnership have been working together for several months on a plan to keep the Crew in Columbus and we have made significant progress," MLS said in a statement. "MLS, the Columbus Partnership and the investor group all agree that for the club to be successful, it requires strong local owners, long-term corporate support, a strong season ticket base and long-term plans for a stadium, practice facilities and associated sites. "MLS is committed to keeping the Crew in Columbus should we continue to make progress on these critical components and agree to key terms with the investor group." Haslam, the Columbus Partnership and Dr. Pete Edwards released a joint statement. "While there are many details to be worked out, our alliance is working diligently and collaboratively with [MLS] to keep the Crew in its community," the statement read. "We are very excited about the quiet but deliberate progress that has been made to date and will keep the community updated as this process moves forward." Haslam added: "We value and appreciate the benefits of a professional sports franchise can bring to a community and are hopeful to be part of the solution to keep the Crew in Columbus. "We would invest a strong infrastructure within the Crew organisation so that we can continue our focus and commitment to building a winning Cleveland Browns football team in Northeast Ohio. We look forward to seeing how this process evolves."